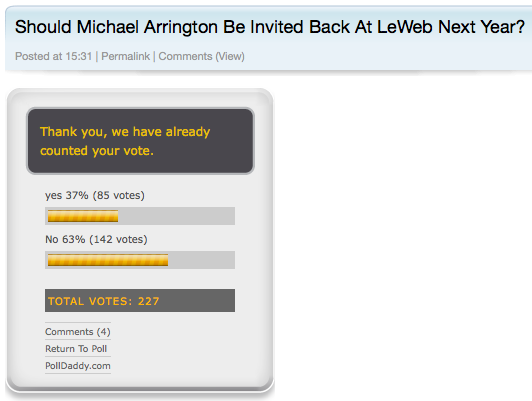 As of the writing of this post, nearly 2/3 of respondents say no, I should not be invited to return. If that’s how the European startup community wants to deal with criticism, C’est la vie. We sent five writers to Le Web this year to cover the startups presenting there and other tech news. Perhaps next year we’ll send none. But I do think this is a dangerous precedent. If journalists, bloggers and speakers know that they may be punished for what they say on stage, you can’t expect a genuine dialog to occur. There is a chilling effect to merely ask if someone should be punished for expressing opinions that some find objectionable. Will the Guardian also be ejected next year for calling the event boring and reporting that there was no Internet connectivity or heat? I expected more from the European community.